One of the most famous of William Branham's healings was that of a young boy in Finland, Kari Holma, who was supposedly killed in an automobile accident, and was restored to life by the prayers of William Branham as instructed in a vision. 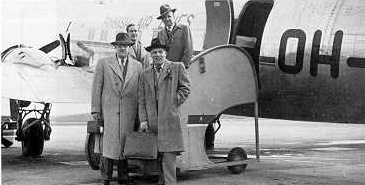 William Branham and others arriving in Finland on April 14, 1950. William Branham is at the top of the stairs. Why does William Branham's story differ significantly from those of Rev. Soininen and Rev. Moore, who were also in the car with William Branham? What was written in the flyleaf of the Bible? Why are there no surviving copies of Bibles with this vision written in their flyleaf? Did the boy immediately come back to life? Did the boy jump to his feet as if nothing had happened? 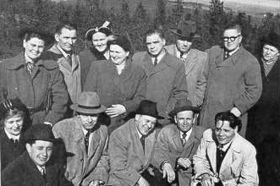 Part of the group at the mountain tower in Finland in 1950 just before tragedy struck. William Branham is the second from the right, bottom row. There were several carloads of people traveling with William Branham. William Branham was in the back seat of one of the cars. These cars were the first on the scene after 2 boys were struck by a car. Because of the serious nature of the accident, the boys were placed into 2 of the cars and rushed to the hospital. Kari Holma was brought to the car that William Branham was in and placed in the back seat with William Branham and the translator, Miss Isaacson. There was no indication that William Branham got out of the car. It was assumed that the boy was dead but a doctor was not present to verify that the boy was actually dead. The prayer for the boy took place in the car. The boy opened his eyes some period of time after the people in the car prayed for him. Subsequently, the boy started to cry. Both boys were taken to the hospital. Kari Holma was released from the hospital 3 days later. The boy had died and was laying on the street for half an hour before William Branham's vehicle arrived on the scene. The following was written in the flyleaf of the Bible - THUS SAITH THE LORD, it shall come to pass, that a little boy, between eight and ten years old, his description, be laying on a place where rocks are wrapped together with cedars and evergreens. William Branham was told to go look at the boy and, although he didn't want to, he finally did. They rushed the other boy to the hospital in one of the cars while Kari Holma remained at the scene dead. The boy had a coat over his face and they uncovered him when William Branham came to look at him. William Branham talked to the Mayor of the city at the scene of the accident while they were waiting for the parents to arrive. William Branham tells everyone that if the little boy is not instantly healed, that he is a false prophet. After William Branham prayed for the boy, the little boy jumped to his feet completely well as if nothing had happened. It is also important to not that according to Pastor Soininen, the only person that felt the boy's pulse and stated that the boy was dead was William Branham. There is no external evidence from anyone that the boy had died as a result of the accident. It is also interesting to note that Gordon Lindsay, who was in the front seat of the car, never told his version of the story in either the Voice of Healing Magazine or in his book. Why does William Branham's story change over time, and remain vastly different from the stories of Rev. Soininen and Rev. Moore? On Friday afternoon a remarkable and startling incident took place which meant much to Brother Branham and to those of us who happened to be its witnesses. Three carloads of us made an unforgettable trip to nearby Puijo Observation Tower situated on a beautiful scenic elevation. The outing was one of the most precious I can remember, because of the blessing of God upon us. Then as we were returning from Puijo, a terrible accident occurred. A car ahead was unable to avoid striking two small boys, who ran out into the street in front of it, throwing one down on the sidewalk, and the other five yards away into a field. One unconscious boy was carried into a car just ahead of us and the other, Kari Holma, was lifted into our car and placed in the arms of Brother Branham and Miss Isaacson who were sitting in the back seat. Brothers Moore and Lindsay were in the front seat with me. As we hurried to the hospital, I asked through Miss Isaacson, the interpreter, how the boy was. Brother Branham, with his finger on the boy's pulse, answered that the boy seemed to be dead, since the pulse did not beat at all. Then Brother Branham placed his hand over the boy's heart and realized that it was not functioning. He further checked the boy's respiration and could detect no breath. Remembering the vision, he asked Bro. Lindsay to look in the 'fly-leaf' of his Bible and see what the vision said about 'a little boy being raised from the dead'. It was discovered that the description of the boy in the vision was exactly like the boy placed in Bro. Branham's arms. Then he knelt down on the floor of the car and began to pray. Brothers Lindsay and Moore joined in prayer, too, that the Lord would have mercy. As we neared the hospital, about five or six minutes later, I glanced back, and to my surprise, the boy opened his eyes. As we carried the boy into the hospital, he began to cry, and I realized that a miracle had taken place. At that time Brother Branham had no assurance that the other boy would live, but on Sunday evening he assured me on the basis of a vision which he had seen early Sunday morning, that he, too, would live. At the exact time that Brother Branham was telling me this at his hotel, the boy lay dying at the hospital. The boy, who was in my car, Kari, was dismissed from the hospital in just three days. And I immediately remembered the vision he told us about in Miami, Fla., of a little boy being raised from the dead. He hadn't known when or where it would be, but he knew what the little boy would look like. By the time we reached the hospital, the little fellow had regained consciousness and was crying. He was soon sent home, and the other boy is well on the way to recovery. Bro. Branham had a vision about him and said he would live. The following is an article by William Branham that appeared in a special overseas edition of The Voice of Healing magazine, published in June, 1950. One morning at about 3 A.M., I was awakened out of my sleep to find that the angel of the Lord was in the room to show me a vision. By the spirit I was transported in the vision to a scene where an accident had just happened. I saw that a little boy of about eight or ten years of age had been killed. He had light brown hair and his clothes looked very ragged and torn. Some men were taking the child to a hospital or funeral home. It was at that moment that the angel of the Lord told me to kneel and pray that the child’s life would return to him. That I did, and life was restored and he lived. Now this vision is to come to pass in the future. I have told it to hundreds of people all the way from Canada to Florida. Many have written it on the flyleaf of their Bible. About two weeks after the vision appeared to me, I was telling it to a crowd of people at a tent meeting in Miami, Florida. The next evening when I was coming to the service, I was taken to a crowd of people waiting just behind the tent. They had a little boy about five years old that had been drowned that morning in a canal. But when I saw the child I said it was not the boy I had seen in the vision. So I offered a prayer of sympathy for the family. …It was in Kuopio, Finland, when the Lord Jesus fulfilled the vision that He had shown me some two years before. It was that of a little boy with light brown hair which was raised from the dead. I was with a group of ministers, who were coming down from a mountain where we had been praying and singing hymns. Among the ministers were Brother Gordon Lindsay and Brother Jack Moore, whom I am associated with. A motor car some 300 yards ahead of us struck a little boy, throwing him to the ground, and then ran over him with such force that it threw him back near the sidewalk. Brother Jack Moore picked him up and brought him back into the car with us. We saw that he was dead. I looked at the little boy and thought I recognized him. Then I remembered that he was the little boy I had seen in the vision, who was eight or ten years old, with light brown hair and who was poorly dressed. I held him to my body and began to pray. Suddenly his life came back. Arriving at the hospital, we were surprised to learn that the car had struck another little boy, and had knocked him to the other side of the road. We had not seen him because he was hidden from our view, and another car had picked him up and rushed him to the hospital. After two days he was still unconscious. The parents of both children came to the hotel to see me. The father and mother of the first boy were so happy because the Lord had given life back to their son according to the vision that He had showed me. I replied that I could not say. But I said that I could say nothing until the Lord showed me. Then they began to weep. I then asked the parents if they were Christians. They replied that they belonged to the church but were not saved. I then asked them if God saved their boy, would they serve the Lord all their days and teach the child to do so. With tears they answered that they would. Then we all knelt and prayed. I said in my prayer, “Father, please have mercy on us and save their son.” Then I returned to my room. When they heard that the dead boy was raised, then they said, "Why doesn’t he do something for the other boy who has been unconscious for two days?" That is what my interpreter, Sister Isaacson, reported that the people were telling the parents of the child that was dying in the hospital. I then said to Sister Isaacson, "I can do nothing until God shows me what to do That is what Jesus said in John 5:19. I can only pray." That night I prayed again for the boy. The report came from the hospital the next day that he was just barely alive, and life seemed to be going fast. The following evening, after returning from the service, I was in my hotel room. The angel of the Lord came into my room. Before me were placed two Easter flowers, one leaning to the south and another to the north. That is just the way the boys’ bodies fell when the car struck them. The one toward the north was the one they took up dead, and the Lord healed. The other one to the south was the smaller lad, who was still unconscious these three days. Then the flower toward the north sprang up at once, strong and alive, but the other one toward the south was fading away and dying fast. The angel made me to understand that the vision represented the two boys. Sister May Isaacson, the interpreter, tried to call the parents of the boy and tell them what I had said, but they had gone to the hospital, for it had been told them that the boy was dying. But when they arrived at the hospital, they discovered that something had happened. The lad had awakened out of his unconscious condition. They said, “While we were watching for him to take his last breath, he suddenly became conscious. It was 10 o’clock at the time.” When the doctors examined the boy, they reported that he would be all right. After checking the time of the vision, I found that it was just 10 o’clock when the angel of the Lord had come into my room. But there laid about a 1925, '30 model Ford, or maybe a little later model than that, American made Ford wrecked, about five hundred people standing around, and two little boys had been coming from school holding each other's hand. And this car, about sixty miles per hour, whirled around the bend, and the little boys didn't know which way to go. One started one way, and one the other, the driver trying to dodge them, hit one little fellow under the chin with his bumper or his fender and threw him about thirty yards and smashed him against a tree. The other little boy rolled right over him like that, and the wheels kicked his little body about twenty feet across the road in a grass flat. The car run over the hill and wrecked. Brother Lindsay and them got out; they looked at it. They come back weeping. Sister Isaacson got out, my interpreter. She come back weeping, said, "Brother Branham, you ought to go look at it." I said, "Oh, no, I can't." I said, "You remember my wife died when I was just a young preacher about twenty-four years old. I buried her and my baby. We only had one little fellow left, and that was Billy. I walked around with his little bottle in my pocket at night. We didn't have enough money to get fire to keep his bottle warm, so I put it under my head. That's the reason he's with me today. I--I've been papa and mama, both, to him. That's what I promised her, when she was dying. And I kept his little body warm, and his little bottle by my own body." And then he was about ten years old, and I said, "I got my own little boy over in America. I--I just can't go look at him. I ain't seen Billy now for about three months; I just can't look at him." And something said, "Go look." I walked over, and had his little coat laying over his face, and they pulled it down. Oh, my, I turned around and started walking away. I don't know whether you're going to believe this or not. That's between you and God. Something put Their hand on my shoulder; I thought it was Brother Moore. I said, "What, why, there's nobody around me, and the hand was still on my shoulder." I thought, "What is this?" And Someone's hand laying on my shoulder, and I turned to the child. I happened to notice that little foot, legs all broke up, his little foot running through his big old, ribbed black stockings. That looked familiar. I said to the chief man, which was the mayor of the city, "Could..." They was waiting for the father and mother to come up. I thought, "Oh, my, what will that little papa and mama think when they come and see this baby laying here mashed up." The other little boy, he was alive, so they rushed him to the hospital in a car. So this little boy had been dead about thirty minutes. They was waiting to get his father and mother before the undertaker moved him. I said, "Can I look at that boy again?" They raised up his little coat, and I looked, them little brown eyes turned back, that kind of dark brown hair, little pantywaist, his feet through his socks. I looked around, there come a hill, coming down from Kuopio Mountain, evergreens, wrap locked, I looked back, and I thought, "That's him." Oh, brother, I may never meet you people no more till glory, but I wished I had the strength, this afternoon, to explain to you what a feeling that is. All devils out of hell couldn't stop it. It's not, if you believe, or this, or that, or the other, it's already done. God said so. I looked and I said, "That's him." I said, "Brother Moore, Brother Lindsay, come quickly." I said, "Get the flyleaf from your Bible...?..." "What's the matter, Brother Branham?" I said, "Read the flyleaf." "THUS SAITH THE LORD, it shall come to pass, that a little boy, between eight and ten years old, his description, be laying on a place where rocks are wrapped together with cedars and evergreens." "What," said, "what's that, Brother Branham?" I said, "Look at the child. Look at there at the rocks." He said, "Is that him?" Oh, my. Oh, God, get the church in that state. Let me stay in that place. I said, "You speak right quick, Sister Isaac, interpret for me." I said, "If the Lord God in a land of America, two years ago, here it is wrote on these brothers' Bible leaf, see if that little boy isn't on his feet alive in five minutes, I'll leave Finland with a sign on my back, 'False Prophet.'" Oh, it's such a wonderful thing when you know what God's going to to do. I had them to gather; I knelt down and said, "Lord God..." If you would like to get the details of this from the mayor, I'll give you his address. I said, "Lord God, in the homeland You did speak of this vision. And I know in Your great predestinated will, it's already finished. So death give back this boy's life." And God Who's my solemn Judge, before this Bible this afternoon, the little fellow jumped to his feet just as normal as he was, hour before he got hit." I said, "Brother Moore, get your Bible." He had it wrote. I said, "That's the little lad. Look at the description. There he is just exactly. He's going to live again." Oh, my. I knelt down according to the way that I seen the vision and laid hands upon the little fellow. He let out a scream, and there he was, back to himself. The people didn't know what to do. Normal, not a broken bone in his body, nor nothing, just as normal as he could be, went on home. And usually, when God's fixing to do something, the whole audience just seems to be spellbound. I remember, over in Finland that when two years before, a vision (many of you still have it wrote in your Bible) that was telling about a little boy was going to be raised from the dead. And we was up at Kuopio looking over at the iron curtain. And when we come down, about thirty missionaries, I said, "I feel real strange; something's fixing to happen." And they said, "What would it be, Brother Branham," as you've read it in my book. I said, "I don't know, but it seems that the Presence of His holy Being is so near." And at that very time the little boy was dying down on the road below us. After laying there for a half hour, and our little party come down and found him... And the people standing around, and the main man of the city, which is equivalent to a mayor of our nation... And I walked over to look at the little fellow, and walked back, I was thinking of Billy Paul, my boy. And I'd been away from home for quite a bit. And how would I feel if that was my boy? And how that little mother and dad was going to feel after they'd come out of the--the farms to see their little darling laying there dead. Only a parent can have that feeling. And I was so tore up. They raised the little coat off his face and let me see him, and I started to walk away. And something happened. I turned to look at the boy again. And the manager, who was standing there, I seen it was the very description of the vision. And then was when the Holy Spirit begin to move. There before five hundred people I could, surely, with the assurance that God keeps His Word, could say to them, "It's THUS SAITH THE LORD; that little boy will be on his feet a living in the next five minutes." There was everything that the Lord had showed in the vision two years before, which many of you still have it in your Bibles. Something foretold that would come to pass, the grace of God to us. And then when praying for the little lad, and his bones broken... He was thrown thirty feet in the air, after he'd been rolled under the wheels and slammed into the middle of the street, with his blood from his mouth, his ears, his eyes set, and no heart beat for over thirty minutes. In five minutes time the little lad was jumping and racing around, praising God. It was the Presence of the Lord upon the hill, saying, "Something's fixing to happen." Standing yonder in Finland that day, and that little boy laying there, and I walked around, him laying there dead, been dead for a half hour. You read in the book. I started to walk away; something put their hands on; I turned around; I thought, "What was that?" And I looked again. I thought, "Wait a minute." Looked back here on the flyleaf of the Bible, "And it shall come to pass, a little boy about nine years old... He'll be killed by an automobile. There'll be a long strip of evergreen, rocks lapped in there; the car will be laying across the road, wrecked. He'll have on little stockings like--up high, a crock haircut; and his little eyes will be turned back; the bones in his body will be broken." I looked; I thought, "Oh, God." I said, "Stand still all of you." The mayor of the city there... I said, "If that boy isn't on his feet in two minutes from now, I'm a false prophet. Ride and run me out of Finland." Certainly. "But if he is, you owe your lives to Christ." That's right. They stood still. I said, "Heavenly Father, across the sea yonder, two years ago, You said this little boy would lay here." That night when that little boy in Finland, that day, rather; laying there dead, been laying there for a half hour, mashed up, blood running out of eyes, nose and ears; his little legs broke up, in his little stockings; and his feet out through the end of his stockings, his shoes gone. I looked, and I thought, "That ought to be that boy." I said, "Say, let's look in the back of that Bible, Brother Moore." We got Brother Lindsay, Brother Moore looked back there "'And it shall come to pass,' SAITH THE LORD," (Oh, my!) "'there will be a--a land where's a lot of evergreen growing. Rocks will be lapped together. A little boy with a cropped haircut, little pantywaist buttoned up here, and his feet... his stockings pulled up high. He'll have brown eyes, they'll be turned back. He'll be killed in an automobile accident. But you lay your hands upon him, and he'll come back to life.'" When the Park broke up in 1974, several people from the Park visited Billy Paul. They wanted to know if William Branham had seen anything about Leo and written it in his Bible. Surprisingly, Billy Paul let them look all thru William Branham's bible. There were little phrases and words written here and there in margins and on the flyleafs, but the men inspecting the Bible couldn't make anything out of it. It was unintelligible. When they asked how this could be, Billy Paul said that William Branham had also had another Bible before the one they were looking at but it had been lost. This page was last edited on 27 August 2015, at 15:13.